We also stock Oyster Shell Grit to provide your chickens with calcium to help them produce top quality eggs. 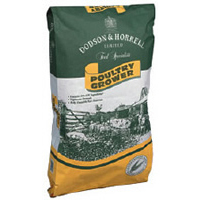 Please click on the poultry feeds below for descriptions of each chicken feed. 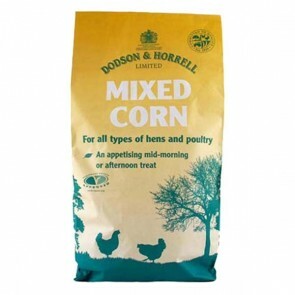 All the chicken food shown on our website are non-mediated and ideal for owners of ex-battery or free range chickens who keep them for eggs or as pets! Please ensure that you provide your chickens with plenty of fresh water, especially if you keep chickens to lay eggs. Always keep a water dish close to their coop so that it's easy to reach. If chickens don't drink enough water, they can die within a few hours, due to salt toxicity. Chickens won't drink water if it's dirty, so it's essential to check their water dish regularly. - The white portion of your chickens eggs should be nice and compact around the yolk, if it runs around the frying pan it's a sign that your cooking older eggs! Chicken Feed: 5 stars out of 5 based on 8 user reviews. Myself and a friend got chickens at the same time about a year ago and I have always used the full range Dodson & Horrell bought from Valu-Direct Pet Supplies of course and she used another brand which I will not name but is not Dodson & Horrell and well to say the least my chickens are by far in the best health and lay the most beautiful eggs. She finally listen to me and started to use Dodson & Horrell and Valu-Direct Pet Supplies about 2 months ago and well the difference is unbelievable. Always recommend Dodson & Horrell and Valu-Direct Pet Supplies. The food and service is the best. On the ball and very prompt delivery.